At American Auto Transport, we’ve been delivering RVs to all parts of the United States since 1988. 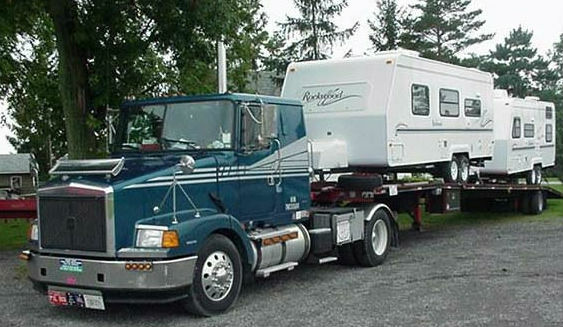 Our experience in the field, coupled with our terrific low rates on auto shipping, make us one of the most popular and reliable RV moving company in the U.S.
RVs are obviously quite large compared to other vehicles and require special care and specific types of carriers to get the job done effectively and efficiently. Some RV shipping companies will try to make do with a standard auto carrier that was not designed to handle the weight and size of most RVs. This will not only potentially damage your motorhome, but it can also be dangerous. Don’t take chances with companies that are inexperienced or don’t use the proper equipment! One of the ways that we ensure our customers get the best quality service is by using only the most modern and up-to-date RV transport carriers. As mentioned above, it’s not a good idea to ship with a company that attempts to use a standard carrier to delivery your recreation vehicle because of the high risk of damage. Our RV carriers are outfitted with hydraulic life gates, which allows for a smooth loading and unloading process without the risk of harming your rec. vehicle. Air cushioned suspension protects your RV during transport to offer the smoothest ride possible, which can be important if you’re having an RV shipped several hundred miles, or even all the way across the country. Satellite tracking comes standard on every truck so that you can keep tabs on your RV with real time updates while it’s being moved. Want to learn more about the many delivery options we offer for RV owners? Call us today to speak to a professional RV moving consultant or use our quote form to see how much you can save! For some RV owners, part of the thrill or owning a motor coach is that you have a portable living space with you everywhere you go. Vacations can be taken at a slower pace and enjoyed with more comfort than camping or renting a hotel. RV owners get the chance to enjoy both the journey and the destination when traveling. Enjoying RV travel, however, doesn’t mean that you always have to drive to your destination. With the rising cost of gas, it’s becoming more and more popular to have an RV shipped so you can enjoy the freedom it enables while vacationing, but without the high cost of gas over several hundred miles. Whether you have a 5th wheel, trailer or motor home, we’ll find an affordable way to have it delivered from point A to point B. Use the free quote form at the top of the page to receive the cheapest RV moving quotes in the industry! You can also call us to speak to one of our staff with any questions. We will save you money! RV American Magazine – News and information for RV owners and camp sites. Great site for camping, community and saving money. RV USA – Your online guide to everything RV related. From buying and selling to local shows and communities, you can find it here. RV & Motorhome Registration – A resource that offers registration information by state for RV owners.